Go take a look at this post at BLDGBLOG on Tatlin’s Monument to the Third International. Be sure to stay for the essay that makes up the second half of the post. Absolutely excellent, this site. One of my favorites, and this post takes things to a new level. 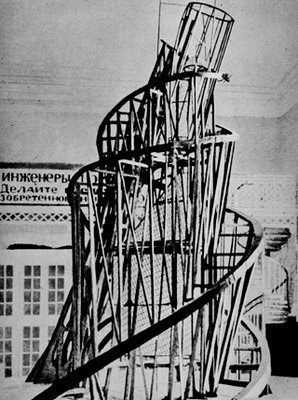 The unbuilt status of Vladimir Tatlin’s Monument to the 3rd International – or Tatlin’s Tower – is both befuddling and possibly contentious. In other words, are we sure that Tatlin’s Tower has not actually been built? Can this state of unconstruction be proven? Perhaps Tatlin’s Tower exists after all – but we’ve been looking in all the wrong places.